Breaking down stereotypes isn’t easy even within the metal landscape. At this point, it shouldn’t matter what gender is playing and performing in this style – the proof should lie in the output, to the good or bad. 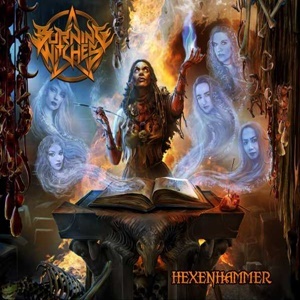 Swiss act Burning Witches are an all-female heavy metal act, earning high marks out of the gate for their demo work and now landing a solid deal with Nuclear Blast for their second full-length Hexenhammer. Switching out second guitarists between records (welcome, Sonia Nusselder), the quintet strives to deliver anthems and dynamic material that brings a lot of their heroes in the metal realm to a current generation craving true, traditional riffs, explosive energy in terms of hooks, and multi-octave melodies. 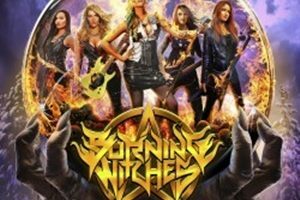 You’ll probably hear a lot of the power, depth, and musicality that put artists like Dio, Judas Priest, and Iron Maiden at the forefront during the 1980’s in the mix for Burning Witches. Double kick and crazy, heads down rhythm guitar layers with twisted, arpeggio-oriented leads and falsetto screams make “Executed” a spitfire number, very much Painkiller-esque with a catchy, mid-tempo refrain that could lock listeners in. Warriors looking for that song of unity will delight at “Maiden of Steel” – which contains super catchy background vocals, a biting vocal delivery from Seraina Telli (Rob Halford and Leather Leone would be proud), plus steady twin guitar harmonies sprinkled throughout to get the toes tapping and hands clapping. The title track is the longest at 6:42, driving home the band’s seasoned musical finesse, attention to interesting transitions, and instrumental action that can reach into Rainbow territory along with a chilling narrative relating to the Hexenhammer book concept told over the course of the album. Modern-style riff chops for “Maneater” do not defuse the savage beast vocally, shifting from strong leather lung action to sadistic screams of terror to add tension to the arrangement. Closing out the record with their version of “Holy Diver” from Dio – adding in more guitar harmonies due to their two-axe attack – it’s clear that Burning Witches aren’t a novelty knock off and the real deal when it comes to their commitment and passion for heavy metal. It’s validating to know that newer bands are willing to create fresh material in that traditional/true heavy metal style so that even as the genres spread and cross-pollinate, there are others that strive for a basic, pure development to their craft.